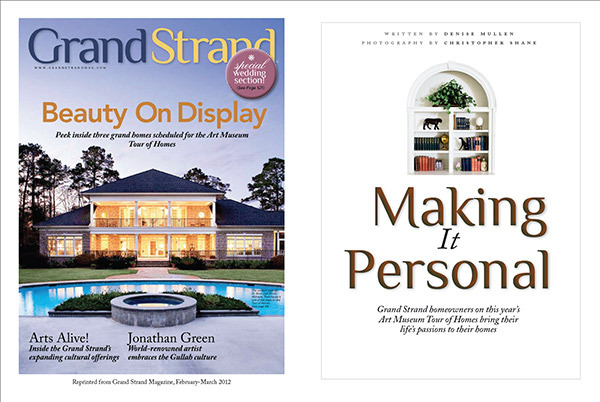 The former Deputy Governor of Tennessee who now sits on the board of governors of the University of North Carolina, Blank has taproot-deep ties to the Grand Strand and loves gathering her whole family at the beach house for vacations and holidays. Blank bought the Ocean Forest track home in 1990—which includes a coveted oceanfront cabana right across the boulevard—and since August 2011, J.D. Abernathy of Dynamic Construction and Marcie Smith from Rose Arbor Fabrics have been straightening supports, reconfiguring rooms and restoring pine floors and walls back to their original glory. Keeping the historic integrity of the beach house intact, the original pine panels the team removed from the walls were re purposed to line the stairway, which was in need of a complete makeover. To accommodate the tall Blank clan, counters and vanities throughout the home have been raised. The fireplace in the ocean-view living room is now two-sided, so it also peeks into the former sunroom, which was converted into a bright and cheery nursery. And with six bedrooms, there’s plenty of room for a gang of visitors. 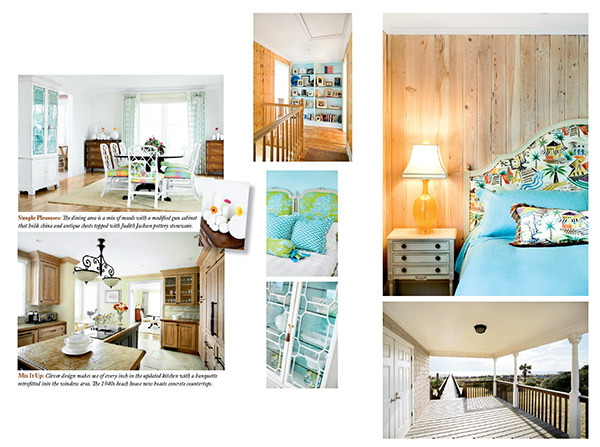 Although a big fan of neutrals, Blank wanted her beach house to be more colorful. Marcie lent her artistic hand to vibrant fabrics and an out-of-the-ordinary paint palette that plays well with animal prints, mosaics, memorabilia and a Judith Jackson pottery collection. This is the address to take notes on if you’re looking for unique renovation ideas. The Great Recession has kicked this craving into overdrive. As a result, we are fixated on low price even more than usual. “Thanks to the recession, we have become, psychologically, a society of bargain-hunters, even bargain-expecters,” Lindstrom writes. Of course, paying a low price or getting a deal is better when consumers think they are getting quality goods or something new and different. As Lindstrom says, we ascribe greater value to things we perceive to be in some way special. In other words, consumers are more likely to get excited if they walk into a high-end design showroom and get a cool fixture for cheap than if they walk into a big box store and paid a similar price for a brand they don’t know that well. Which brings us to your homes. We know you’re always looking for products to meet your budget, but your real goal should be to find products that also balance low-cost and good looks—those that add a measure of coo, visual interest, personality, and creativity. Budget products are good, but affordable choices that look cool and different are even better. Of course, price should not be the only criteria for choosing products. You also need to factor in perceived value (for example, glass tiles have a higher perceived value than ceramic tile, and it also looks cooler), architectural impact, and uniqueness. It helps to approach product acquisition with an open mind: be creative, think outside the box, and visit websites or stores that you wouldn’t normally think to visit. To help you get your creative juices flowing, here are 10 more low-cost products offering great visual appeal. For those looking for a glimpse into housing’s future, the industry has a new oracle in the Universal Design Living Laboratory (UDLL)—a new demonstration home in Columbus, Ohio, that combines universal design, energy efficiency, and healthy building. The project, started in 2003, is the result of an accident when one of its owners, Rosemarie Rossetti, was hit by a falling tree limb while on a bike ride. The impact left her paralyzed from the waist down and confined to a wheelchair. After weeks of treatment, she returned to her “two-story dream home” only to find it unusable. The house “was a major source of frustration, limiting my mobility, independence, safety, and comfort,” Rossetti writes on the UDLL website, referencing how she could not access either the second floor or basement, reach food in cabinets, or easily operate her top-loading washing machine. “When I bring home groceries, I have to carry the bags in my mouth while I maneuver down the walk and up the lift,” she writes. Eventually, both Rossetti and her husband, Mark Leder, realized their home would never fit the bill and went in search of a new one. But when they were unable to find a builder in their market that offered home plans that could fully accommodate Rossetti’s needs, they decided to do it themselves. Almost nine years later, the UDLL—which will be open to builders and the public as an idea house—is finally nearing completion. While not every buyer will need a home that is completely wheelchair accessible, the project’s story is illustrative of the industry’s current lack of options for the large and growing segment of the population that requires homes accessible to those with mobility issues. And at a time when consumers’ concerns about the energy-efficiency, green, and healthy aspects of their homes are growing, the UDLL’s plan is prescient. When finished, the 3,500-square-foot, ranch-style home will not only be completely wheelchair accessible, but also certified under LEED, Energy Star, the National Green Building Program, Livable Design, and life-flex. Filtration systems boost the home’s air and water quality. No carpeting is included in the home, which helps both with wheelchair accessibility and air quality by reducing the use of materials that shelter mildew and allergens. A central vacuum systems helps to eliminate dust inside, and “everything that was brought into the house was evaluated for hazardous VOCs,” Rossetti says. Much of the home’s plan—which was designed by Patrick Manley, president of Manley Architecture Group, and enhanced by interior designer Mary Jo Peterson in the kitchen, bathrooms, closets, and pantry—hinges on planning for adaptations that may be needed down the road, such as reinforced ceilings and walls for lifts and grab bars. For timely information on homeownership rates, the standard reference is the Census Bureau’s Housing Vacancy Survey (HVS), which releases information for the U.S. on a quarterly basis. On an annual basis, the HVS also provides homeownership rates for the 75 largest metropolitan areas. This information can be quite useful, but smaller areas may have particularly high homeownership rates or otherwise be of interest. Also, the metropolitan areas in the HVS are entire Metropolitan Statistical Areas (MSAs), which can obscure important differences within some of the larger metros. The New York-Northern New Jersey-Long Island MSA, for example, covers the five boroughs of New York City, all of Long Island, extends well into New Jersey, and even includes a county in Pennsylvania. An area this large may easily have significant sub-areas with different homeownership rates. For less timely data but more geographic detail, the standard source is the Census Bureau’s American Community Survey (ACS). In a recent study, NAHB used the latest (2010) ACS data to calculate homeownership rates for all MSAs in the country, breaking the eleven largest their component divisions (the government’s classification scheme often splits MSAs with a population of at least 2.5 million into “Metropolitan Divisions”). The ten metros with the highest homeownership rates are shown below. Palm Coast, Florida tops the list with a homeownership rate of 81.5%. Most of the ten high-homeownership areas are relatively small in terms of population—eight have a population of under 100,000. Most also have relatively moderate home prices— eight have a median home value of less than $175,000. Nassau-Suffolk, New York stands out as an area that combines a relatively high rate of homeownership with a population of over 900,000 and a median home value of over $400,000. Nassau-Suffolk is a Metropolitan Division within the larger The New York-Northern New Jersey-Long Island MSA. An adjacent Division in the same MSA ( New York-White Plains-Wayne Division) has the lowest homeownership rate of any metro in the country—39.5%. Homeownership is only one of many possible statistics that may be used to evaluate a local housing market. The NAHB study also shows the number of owner-occupied housing units; home owner vacancy rate; share of single-family detached homes; value of homes owned; home owner incomes; growth in stock of single-family detached homes; and share of homes built recently for each of 384 metro areas, all available in a single spreadsheet.